I’ve been reading some posts regarding the music that can stimulate our brain and mood, but I ain’t that sure whether the articles written are true or else, just some pieces of rubbish. Today, I feel quite exhausted and lethargy due to I ain’t feeling so well since yesterday. On my way to office, I tried to listen to one of the Linkin Park’s song, “No More Sorrow”, which I found there are lots of drum beats and electronic guitars elements (lead, bass and rhythm) and Chester’s screaming. All of sudden, I felt my mood is changed, my lethargy turned into a new energy and alert along the way until now. 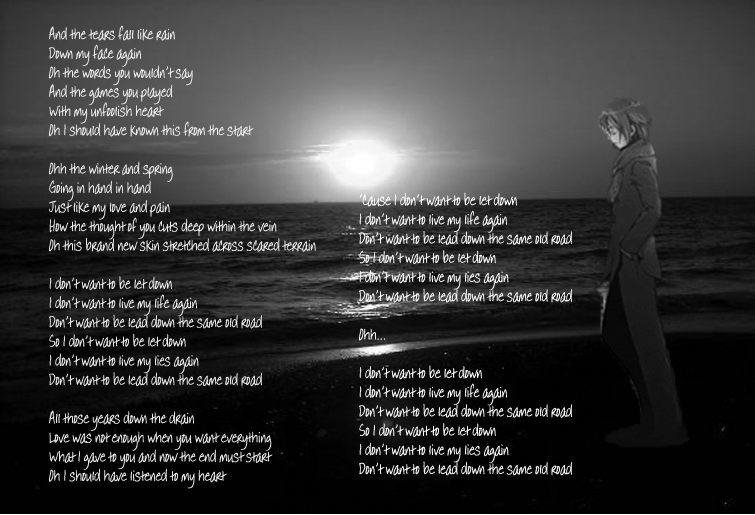 The lyric of the song, “Let Down” by Dead By Sunrise. I put it into the photoshopped pictures, just to have a feel for the song. The song reflects what’s in my mind in the meantime.